Lightly oil a 13×9-inch baking pan and set aside. In a medium saucepot add the water, polenta and salt. Place over high heat and bring to a boil while whisking. Reduce the heat to medium-low and cook, whisking frequently, until the polenta thickens and begins to pull away from the side of the saucepot, about 15 minutes. Remove from the heat and stir in the pepper, butter, truffle oil and Parmesan cheese. Adjust the seasoning as needed. Transfer the polenta to the prepared baking pan. Using a rubber tipped spatula, spread the polenta out evenly. Lightly oil a 13×9-inch piece of parchment paper and place oil-side down directly onto the polenta. Refrigerate for about 45 minutes to set. Preheat the oven to 450 degrees F. Lightly oil a baking sheet with olive oil and set aside. Rotate the baking pan horizontally and cut the polenta in half across. Working vertically, make 16 cut across the polenta. Leaving you with 32 polenta fries. Carefully remove the polenta fries from the baking pan and place on the oiled baking sheet, about 1/2-inch apart. 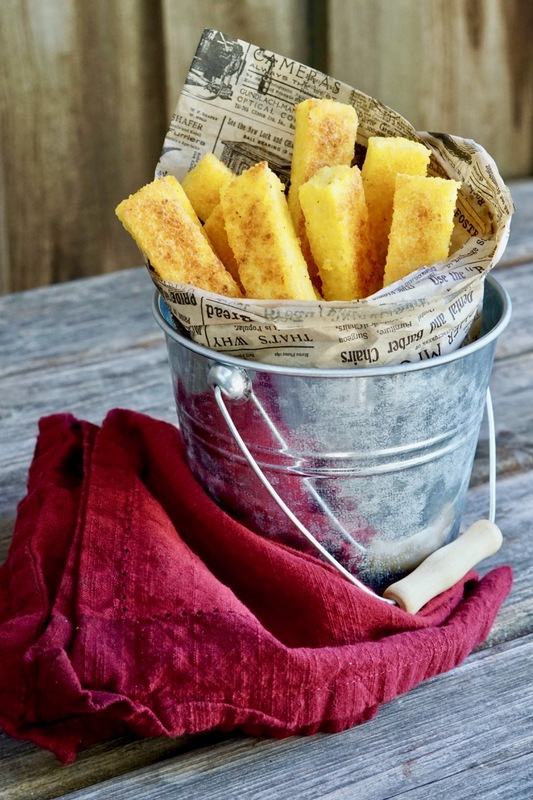 Using a pastry brush, brush the tops of the polenta fries with oil. Place in the oven about 4-inches from the and bake and good until golden, about 20 minutes. 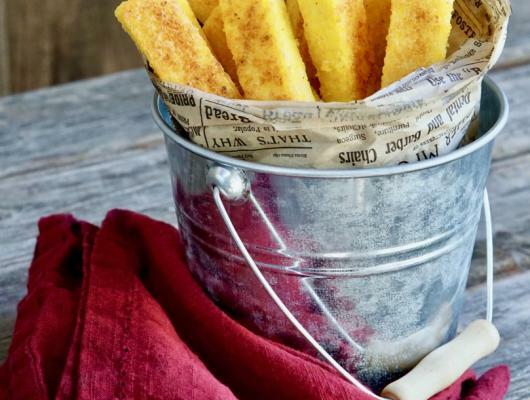 A true comfort food; crispy baked truffle polenta fries.